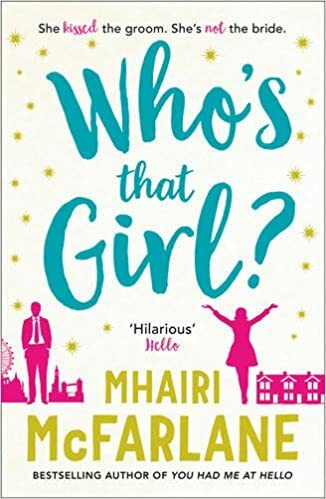 I read and loved Who’s That Girl by Mhari McFarlane when it was released in hardback last year. The good news is that it has just been released in paperback. And the even better news is that, thanks to the publishers Harper, you can win a copy by entering my giveaway! If you’re not lucky enough to win, you can order a copy online here. First of all, I’m sharing my review again. I lost a large part of a weekend reading Who’s That Girl but it was definitely time very well spent. Mhairi McFarlane has come up with yet another cracker of a read. It starts with Edie at her office colleagues Jack and Charlotte’s wedding. At the very beginning she is musing how photos on social media can give a very misleading picture and my goodness doesn’t she find how just how badly social media can affect your life as the story goes on! To be fair, she was caught kissing the groom just hours after he promised to love his new bride until death did them part. Immediately, Edie is horrified at what has happened and tries to hide herself away from the fallout. She knows she can’t possibly go back to work in the same office and expects to resign. Her boss, the suave Richard, has other plans though recognising her talent and arranges for her to work in Nottingham, her home town, ghost writing the ‘autobiography’ of mega film star Elliot Owen. Of course, they get off on completely the wrong foot but soon become friends. Now so far this sounds like a typical will-they-won’t-they kind of chick lit read but it’s not. Mhairi McFarlane has a real knack for showing the complications of everyday life for her characters. Despite the fact that Elliot is such a huge star, the friendship and working relationship between him and Edie seems completely natural. The reader is taken into the crazy world of celebrity along with Edie and can see how false it is.The characters feel like real people dealing with real issues. There is a lot of humour in the book but a lot of serious issues are addressed too such as the cyber-bullying which Edie has to deal with. Edie’s relationship with her family is very much a part of the story too. Her mother died when she was quite young and the family have never quite got over this and haven’t talked about it. Her dad was lovely and tried so hard to keep the peace between Edie and her spiky sister Meg – there were some terrific scenes between the battling sisters. Their neighbour Margot was hilariously eccentric and helped Edie to really think about what she wanted in life. Who’s That Girl was, for me, a hugely satisfying read. With witty dialogue, feisty characters, a great plot and a healthy dose of romance Mhairi McFarlane has written another fabulous story which will please her many fans. Labelled as a home-wrecker and office outcast, when her boss offers her the chance to get out of town Edie jumps at it, even though moving back in with her eccentric father and prickly sister isn’t exactly the escape she needs. I love reading about every day complications, as if I hadn’t enough in real life, haha! Also, the mix of humor and serious issues, when well-handled, makes for a great read that usually leaves you with a satisfying feeling when you reach the end. Great review!